Appium is an open source test automation framework for use with native and hybrid mobile apps. It drives iOS and Android apps using the WebDriver JSON wire protocol. It’s a great tool for automating mobile apps. Here is a step-by-step tutorial for configuring Appium tool for Android apps automation. We will use Eclipse and TestNG framework to run Appium automated test on Android device/emulator(If you have not configured TestNG on Eclipse, refer this tutorial). Let’s check out prerequisites of this setup process. Android SDK installed in system. We will now start setting up Appium Android configuration from scratch. Follow below steps for the same. Install Android SDK in your system. Set ANDROID_HOME environment variable which points to your SDK directory’s \sdk\ folder. Append ‘%ANDROID_HOME%\platform-tools’ value to your PATH environment variable. Start your Android emulator or connect your Android device to your system (Make sure you have Android Debugging option enabled in your Android device). Open Command Prompt and navigate to your Android SDK’s \platform-tools\ directory (Eg. D:\adt-bundle-windows-x86_64-20130514\sdk\platform-tools). Run ‘adb devices’ command. You should see your connected devices listed in Command Prompt window. Run ‘adb start-server’ command. 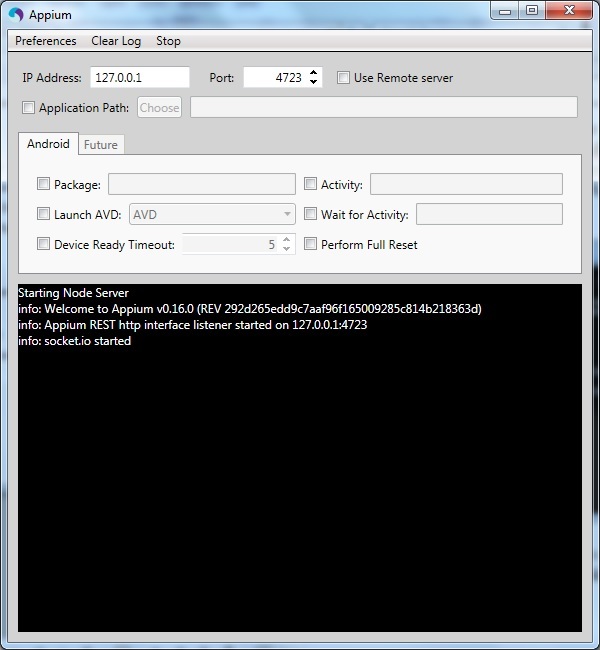 It will start ADB server which will be used by Appium to send commands to your Android device. Now, navigate to Appium directory in your system and start Appium by clicking Appium.exe file. Click Launch button. Your Appium console should be displayed as below. Create a Java project in your Eclipse and reference Selenium 2 and TestNG JARs. Create a new Java class in your project and enter below code. capabilities.setCapability(CapabilityType.BROWSER_NAME, ""); //Name of mobile web browser to automate. Should be an empty string if automating an app instead. Run your test using TestNG. Let us know in the comments how this Appium Android configuration tutorial work for you. Yes, that’s true. Thanks for pointing it out. Updated the code. Thanks for sharing this information.It was very nice blog to learn about Appium . Not sure what may be causing the issue but try changing URL to http://127.0.0.1:4723/wd/hub/status. i am getting error timeout while trying to contact RemoteTestNG. Any ideas? I am having problems with this tutorial as well. I am brand new to Appium so I may need a bit more hand holding here as to what I should change. Here is the error I am getting. I coped and pasted the code above but now see I need to change some things. Not sure what to do with “app package” so any info would be appreciated. besides this you don’t need to specify app package name if you are planning to test whole application… from given apk , beside this I can help you more if you post whole @BeforeClass/@Before method declaration. Here is my code. Thanks!!! capabilities.setCapability(CapabilityType.BROWSER_NAME, “Chrome”); //Name of mobile web browser to automate. Should be an empty string if automating an app instead. One other thing. How do I change the ANDROID_HOME variable?? Could that be my problem?? Sorry I did not see that the comment with my code had posted before. I am new to changing variables on the computer so how can I check the $PATH variable to be sure that it is correct. Thanks!! I have appium running for my device and my phone does something. All I want my test to do is open Chrome and go to Yahoo home page. I am attaching my error messages and my code. Thanks!! Hi All, i am new to mobile automation and i would like to learn Appium as well as i need some job support on it. Please help me on this i will pay you for training and job support. How we get the package and activity name from the .apk file…. Himashu – To get package and activity name, you need to install APkINFo app. with the help of APKINFO app you can find the package name and activity name of required app. My code is exactly as given above. Do i have to add those capabilities to make it work? I’m having the exact same error while running a Nexus 5 emulator. I’m not sure what the platformName and deviceName should be for the desired capabilities object. Someone know what’s the problem? I tried to run the code. I was able to launch the application in the real time device(i.e @BeforeClass got executed ) but after that I was not able to execute the other methods(i.e @Test). It does not give any error. appium waits for some time and then it closes the app saying that “no further instructions were recieved so closing Appium”. Can you please help me.